Michel (pronounced Michael) has recognized the contributions of Paul Motian, and he has re-created a complete repertoire of his music. Ann Arbor-based jazz guitarist and composer Michel now has recorded a compendium of Motian's music played with expert musicians from Southeastern Michigan, a one-of-a- kind tribute to Paul Motian's music, with adaptations and extrapolations akin to the fertile musical mind Michael is inspired by. 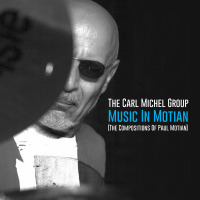 In his research on and recording of Motian’s music, Michel discovered a blog of Cindy McGuirl, Paul Motian’s niece, who has self-publishing a book, The Compositions of Paul Motian Volume 1 1973-1989. Volume 2 of Motian’s compositions will be out early 2018. Her blog, titled “Uncle Paul’s Jazz Closet,” has podcasts of radio shows that she curates featuring her uncle’s music.